Yes, I’m sorry to bring this news to you (just in case you didn’t know it already), but there are only nineteen sleeps until Santa visits. As always I plan ahead as this saves money and avoids a last minute panic. I do my Christmas shopping throughout the year, picking up bargains etc in the sales, so I can get more for my money. This does take some planning as obviously we needed the money in the first place to be able to buy the presents. So in the ‘Thrift’ household we actually save for birthdays and Christmas presents each and every month throughout the year, so I can buy something that will be just perfect for someone, when I see it. I carry a list in my handbag of exactly who I need to buy presents for and an exact budget for each present. This way I never duplicate presents or go over budget. I found an offer for a calender from an on-line company called ‘Photoworld’. 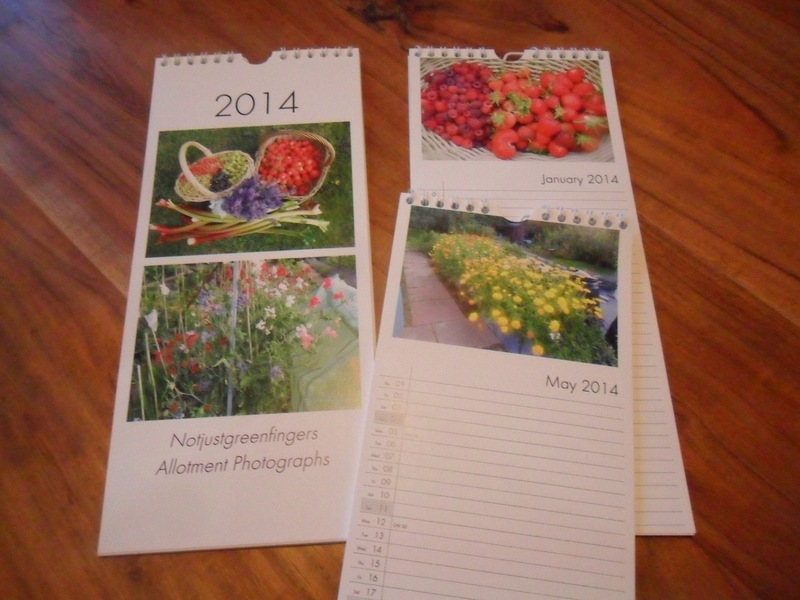 I down-loaded some of my allotment photographs and they produced a calender with them on. I managed to get three calenders for £13.74, which I think is a bargain! I must say though, I didn’t think they would be up to much as they were so cheap, but they were brilliant. I even managed to get my ‘Notjustgreenfingers’ logo on the front. A few years ago we made calenders by printing off our photographs and I’m sure they cost us more money to make after buying the photopaper and ink etc. 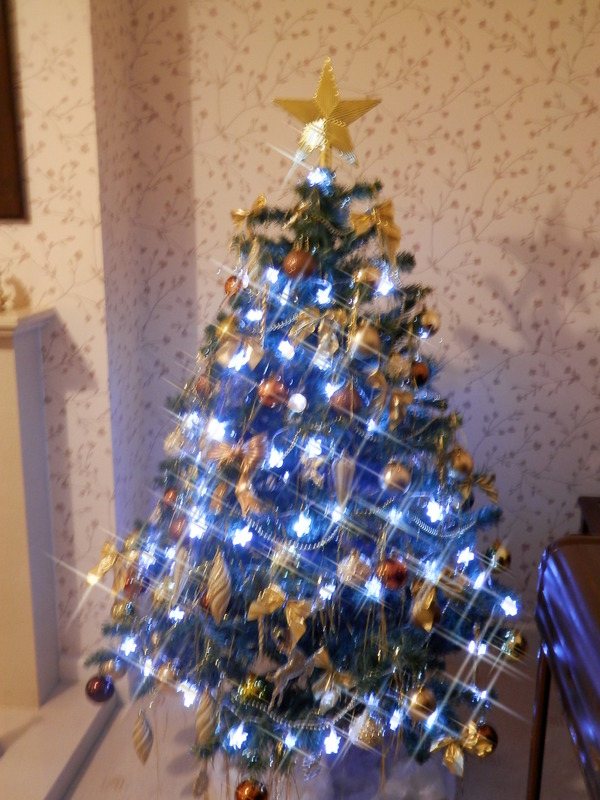 One of our family traditions is to put the Christmas tree up on the 1st December. Unfortunately due to building work, our Christmas tree isn’t up yet and I have two teenage daughters complaining about this daily. Our builders are coming back shortly to install our old gas fire from the old back room, into our front room. We only bought the fire and fire surround approximately four years ago, so we wanted to reuse it as the fire we have in the front room was installed in 1975! As the builders need to knock a larger hole into the chimney breast, we think it would be daft to put the tree up now as it would get covered in dust. So we will all have to wait a little bit longer here. 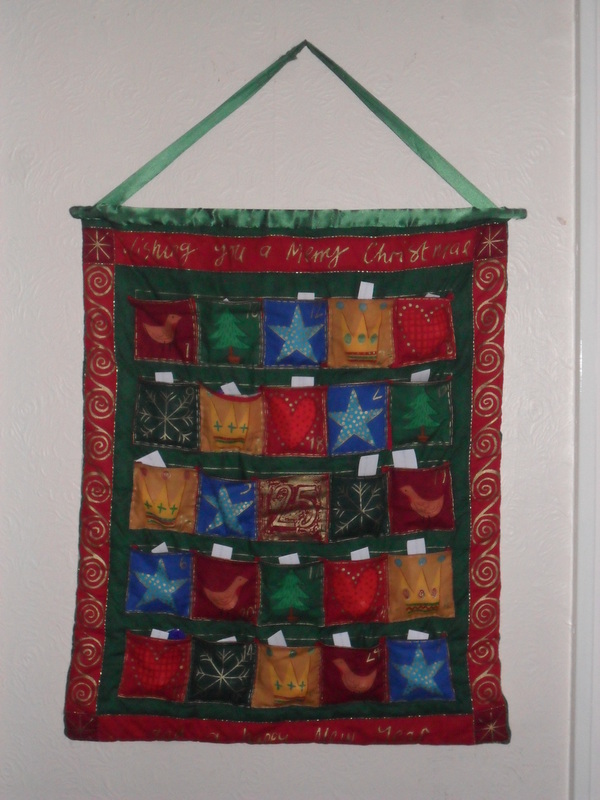 Another tradition we usually do on the 1st December (which I’m pleased to say we have done this year), is to hang our Advent calender up. When I grew up, we had just one calendar that we used year after year. It didn’t have chocolates, it just had a different ‘window’ that you opened each day, but my sisters and I loved that calender. On the 15th December it had a large ‘barrel’ that opened and revealed Santa telling us it was only ten days until Christmas and every Christmas we would argue about who would open this door…I can’t imagine children would even bother with an advent calender without chocolates these days! 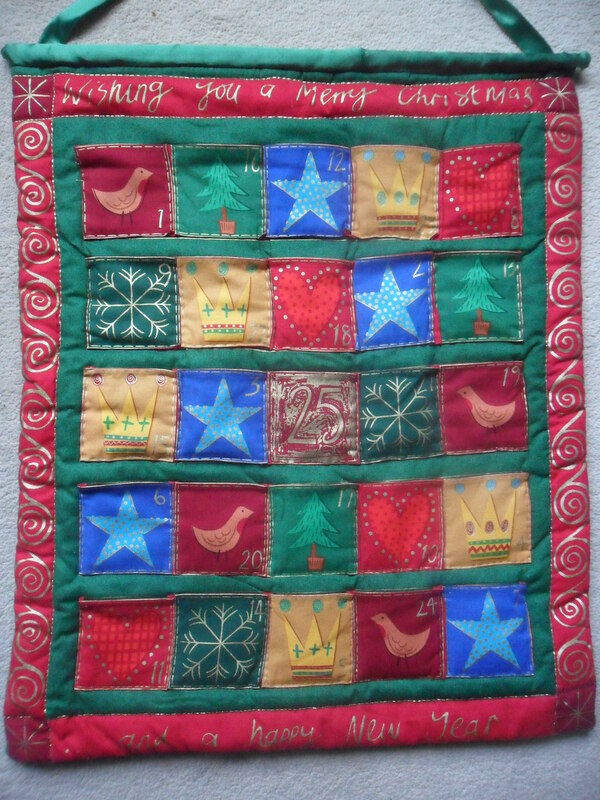 When my first daughter was born, one my sisters made an Advent calendar as a present for us. She stitched little pockets on it so we could pop a sweet into it each day for the children. It really is beautiful and still looks as good as new today. At first we would put a chocolate in each pocket, which they opened each day leading up to Christmas, but as they became a little older, we put a piece of paper in each pocket instead. The paper had a really easy ‘clue’ written on it, which helped them to find where I had hidden the chocolates each day. The children had such fun finding them, in fact when they had their friends to play, they too would join in with the clues. I would buy chocolate coins and put them in a ‘Treasure Chest’ for them to find. As my daughters got older, the clues got harder to reflect their age and now instead, I put a brainteaser in each pocket that they have to solve before they can have a chocolate. I now also use dairy free chocolates for my youngest daughter. My teenagers still love our advent calender. I wanted to tell you about something I made this week that I am very proud of. 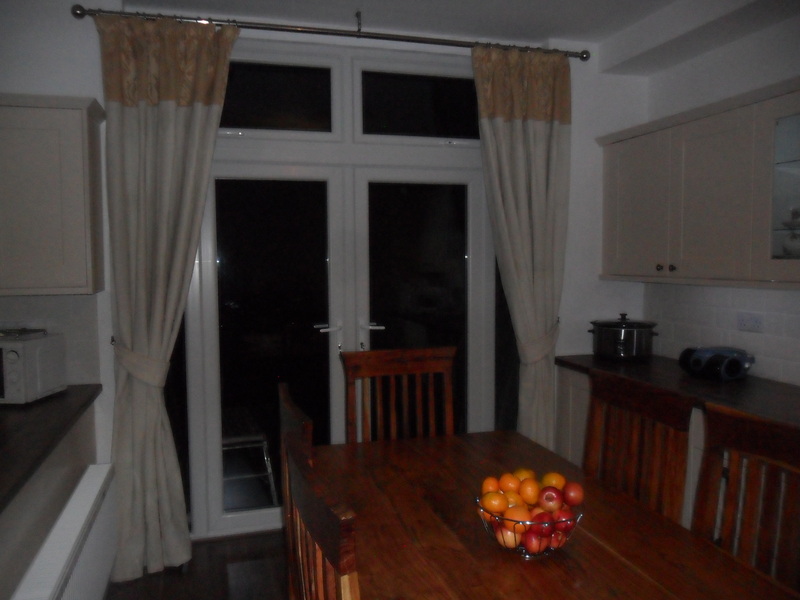 Last month, we searched high and low for some curtains to fit our french doors in our new kitchen. Unfortunately, we discovered you can’t buy ready made curtains quite that large. We visited various shops and found that the curtain material was very expensive, but we did find it wasn’t too much more money to have the shops make the curtains up for you. 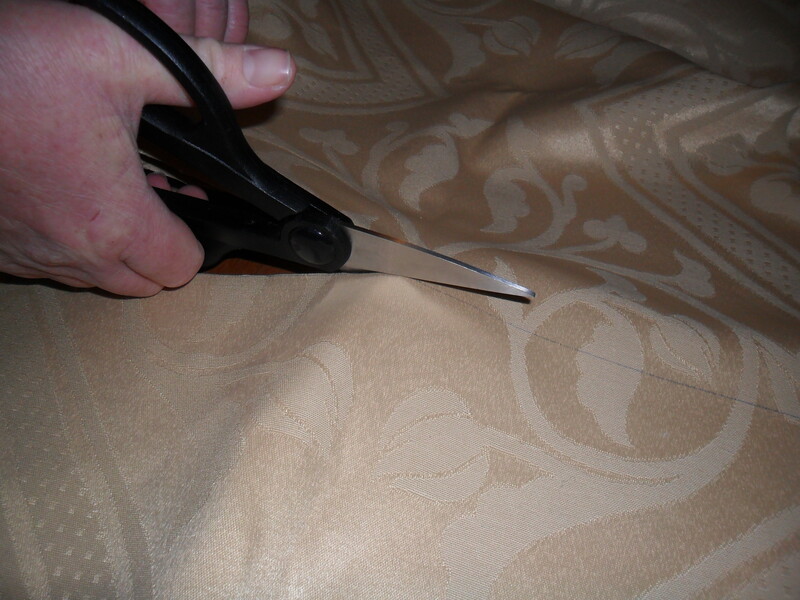 We looked at lots of different materials at different shops and found that with lining, they would be approximately £300!….this amazed me…do people really pay this amount for curtains? 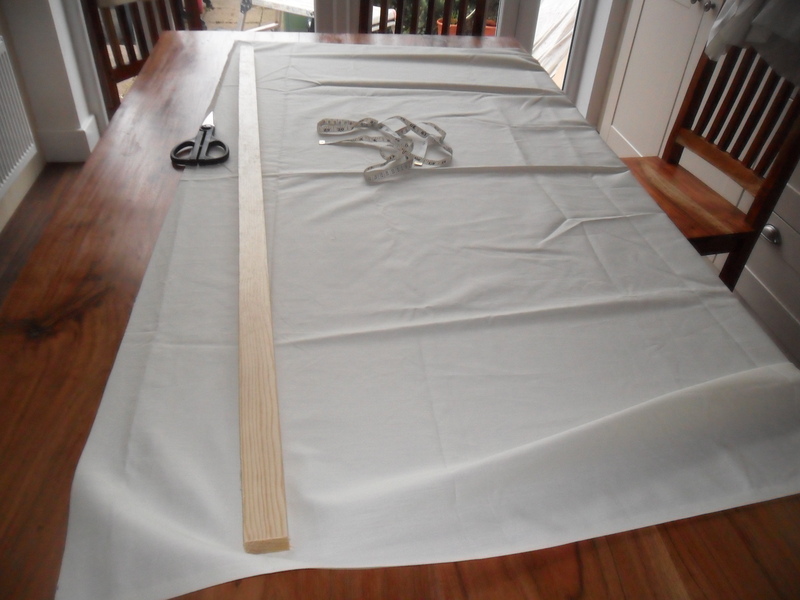 I decided to visit the market for material and make the curtains myself, but after working out how much material I needed, ensuring I had enough for the pattern repeats, lining and header tape, it still would have worked out approximately £200 to make! So I hit the charity shops in desperation. 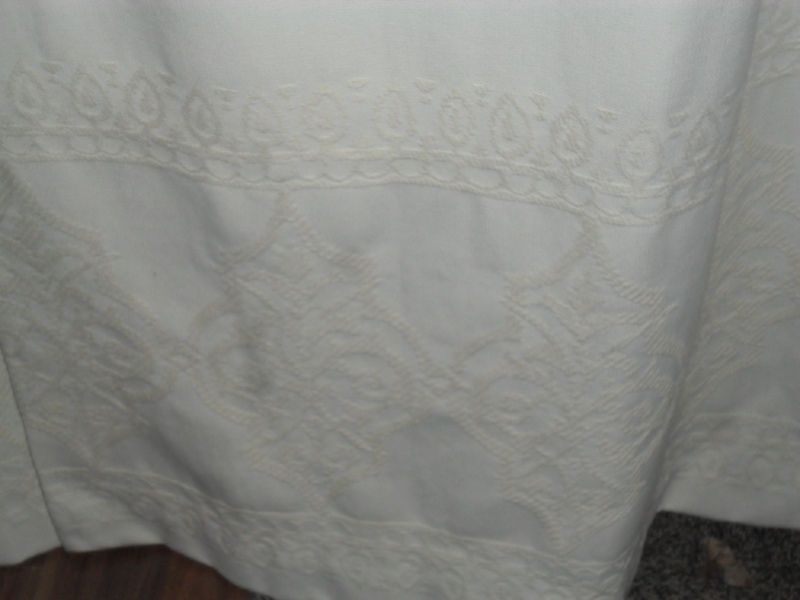 I spent the morning looking at old, faded curtains which just wouldn’t do for my new kitchen and I was beginning to feel like we had no choice but to save up for the material off the market……until I went into the last charity shop I could think of and found this…. Six meters of unused gold material, lining and header tape for just £10…I thought I was seeing things. I knew this wasn’t enough material to make the curtains, but I remembered I still had my cream curtains from my old backroom window which are still perfect (even though they are 11 years old) and I decided I could maybe do something with both the gold material and the old cream curtains. As an extra bonus when I went to pay, the lady in the shop came out with another four meters of the gold material from the back of the shop. Obviously someone was going to make curtains and then changed their mind. 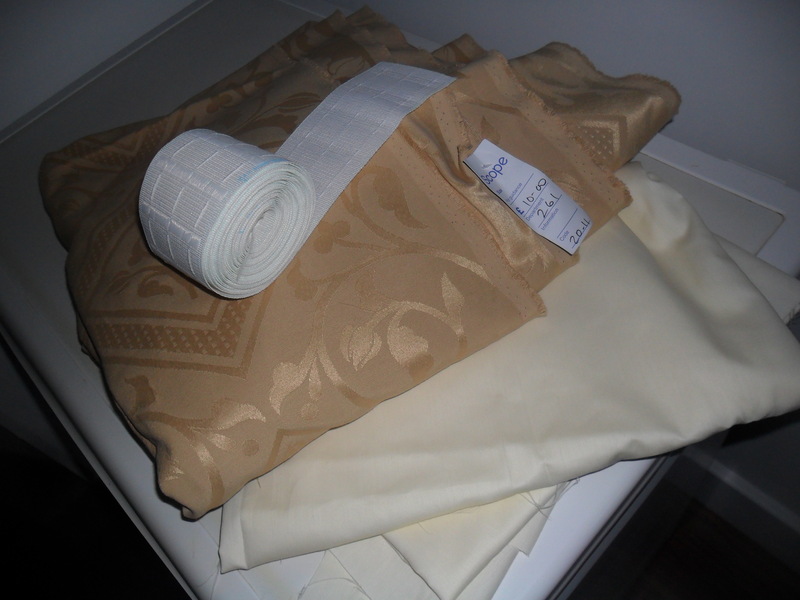 So I got ten meters of brand new gold material (in two pieces), lining material and header tape all for £16…now I think that is a real bargain! I have worked out that I have enough material for the curtains, cushion covers, roman blind for the window over my sink and I think I have enough for a table cloth as well. What a lucky find it was! I looked at two toned curtain images on the internet, just to make sure my idea would look ok and then I sent my old curtains to the drycleaners (courtesy of Tesco vouchers) . I then nervously set to work. I am lucky as I have an old sewing machine which I use from time to time. 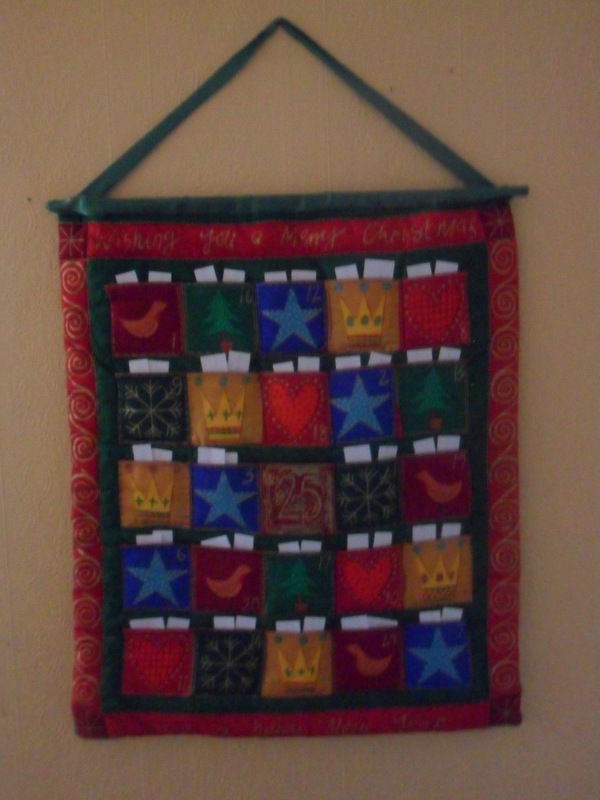 I learnt a small amount about sewing a school, but mostly I make things up as I go a long. 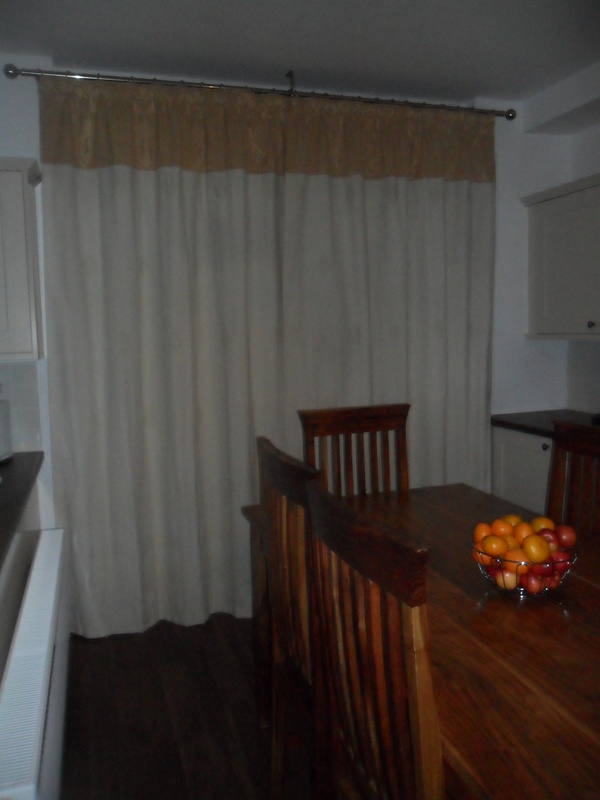 I scutinised my old cream curtains to see how they were made (as they were good quality when I bought them) and made sure I worked in the same way….and here is the result. Let me know what you think? I’m really pleased as they match my kitchen and I’ve saved us nearly £300….Mr Thrift is very pleased with this. There are only 34 nights sleep until Santa comes. There are so many different types of advent calendars, usually with pictures of pop groups or TV program characters covering cheap chocolates, but children love them and they are part of Christmas. When I grew up, we had just one calendar that we used year after year. It didn’t have chocolates, it just had a different ‘window’ that you opened each day. In fact the number ‘one and two’ windows had been torn off years before, so we didn’t even get to open them. 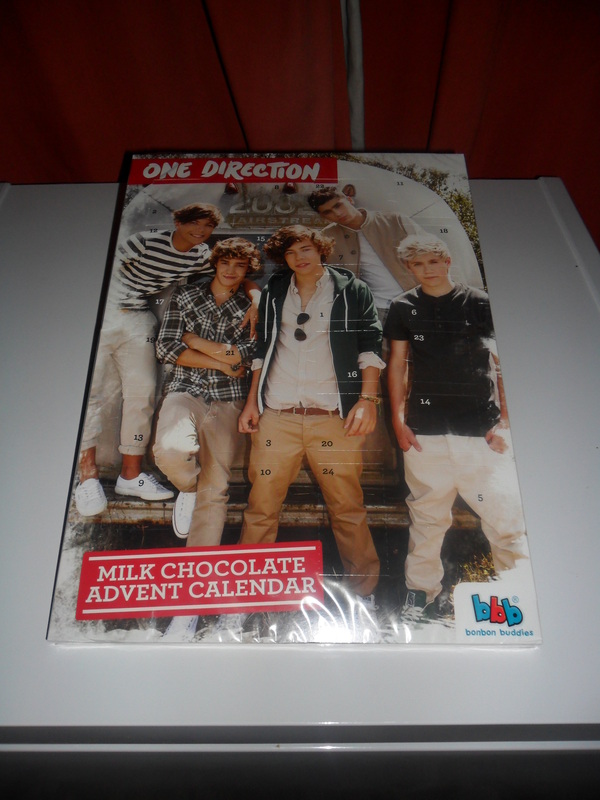 But how we all loved the calendar, it was so exciting as when the calendar came out, it was the start of Christmas. One fond memory I do have, is that number ‘15’ was a large barrel that opened and revealed Santa telling us it was only ten days until Christmas. I have three sisters and I remember all the arguments that we had, deciding who would open this door! This calendar was the start of a family tradition in this house. When the children were tiny we started by putting a chocolate in each pocket, which they opened each day leading up to Christmas, but as they became a little older, we put a little piece of paper in each pocket instead. The paper had a really easy ‘clue’ written on it, which helped them to find the chocolates that I hid in a different place each day. The children had such fun finding them, in fact when they had their friends to play, they too would join in with the clues. I would always buy some chocolate coins and put them in a ‘Treasure Chest’ for them to find. As my daughters got older, the clues got harder to reflect their age and we still do this now. The only difference now, is my youngest daughter is dairy intolerant so chocolate coins are obviously out. Last year was the first Christmas after my daughter was diagnosed with a dairy / lactose intolerance and I really didn’t want her to miss out on our family tradition. Instead of chocolates, I kept my eyes open throughout the year, for lots of little bits and bobs that were in the sales and reduced, but things I knew my daughters would use rather than just throw away. I bought pens, pencils, rubbers, pencil sharpeners, sweets my daughter could eat etc., and wrapped them all up individually. You may think this cost a lot of money but it didn’t really as I bought them all reduced for approximately 10p per item. So the whole calendar probably cost less than two good quality Advent calendars. 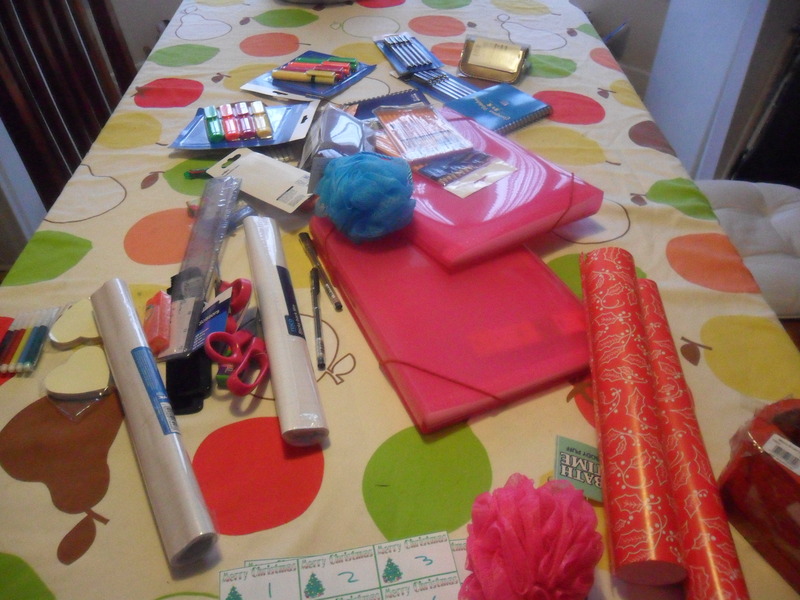 This year I have done exactly the same and I wrapped all individual advent presents and sat and worked out the advent clues. For the last few years I have put a brain teaser in each pocket that they must work out first before opening a clue to where the present is hidden. Even as teenagers they still enjoy doing this. I find most of the brain teasers on the internet, there are millions to choose from and I just make up clues as to where the presents are hidden around the house. 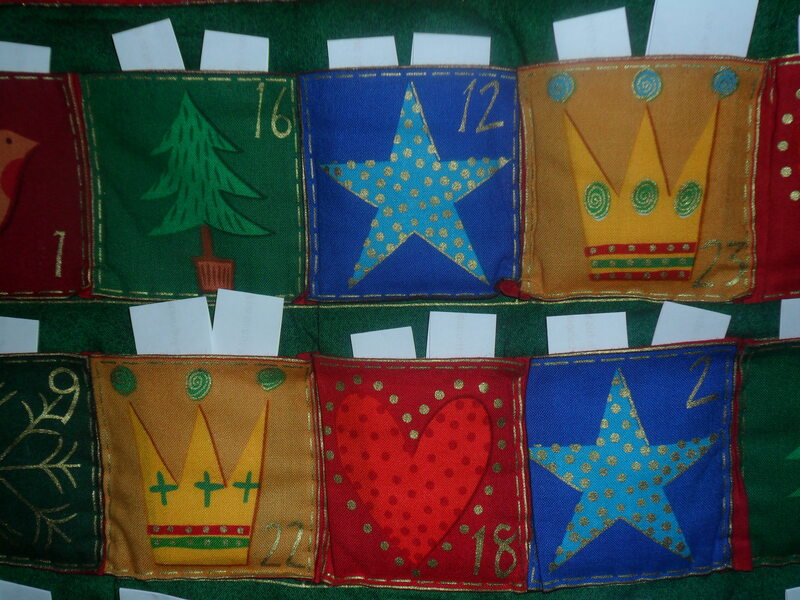 The preparation for the advent calendar does take some time, but it is a lovely family tradition. I would really love to hear about any family traditions that you have at Christmas. So please tell me about it by commenting at the bottom of this post.